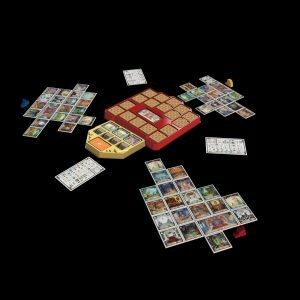 This game like all of the games Stonemaier games create, is very cleverly and beautifully designed. The way it plays is easy to pick up, so this is a good game for someone new to board gaming but the placement for maximum scoring effect makes it fun even for very experienced board gamers. As you all take your turns at the same time it is a game that doesn’t ever feel like it drags on whether you play with three or seven people, you can easily play a game in half an hour once you are used to the game. It uses the same basic engine that Between Two Cities uses but is very much it’s own game not just a skin on the old one, as it also utilisines some mechanics from the Castles of Mad King Ludwig board game. It is based on the Castles and palaces of King Ludwig II also known as Mad King Ludwig. He was an eccentric person who loved to design and create amazing buildings with opulent rooms. I have visited one of his castles and was amazed how over the top each room was decorated, if you ever visit one of his castles you’ll understand why creating this game around his work was a stroke of genius. You can read more about Ludwig II on this wikipedia page. This is a tile game where each player builds two castles, one with the person on their left and one with person on their right, depending on where the tiles are placed the score can vary. There are seven types of basic tile, food rooms, living rooms, utility rooms, outdoor rooms, sleeping rooms, corridor rooms and downstairs rooms Each tile is different and there are Easter eggs hidden in the artwork of some of the tiles. You aren’t restricted to a 4×4 grid as you are in Between Two Cities (5×5 with the expansion) you can build tall or wide castles, it’s up to you and the other builder, the only rule is that above ground floor you can’t build over empty space. You have two rounds (one passing tile clockwise and one anti-clockwise) you start with nine tiles each, take two, one for each castle and place the rest under the city you share with the person who uses those tiles next. You all reveal your chosen tiles and negotiate with your neighbours for the best tile placements for your cities that you can. When you place a third tile of the same type of room in your castle, you get a bonus tile or card depending which room type you laid. You also get a bonus on the fifth tile as well. Scoring is done at the end and it is your second highest city that wins you the game. 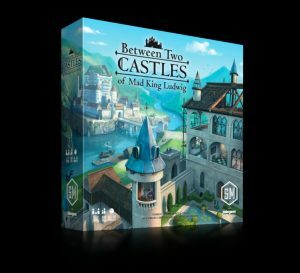 Between Two Castles feels more sophisticated than Between Two Cities and the elegance of the scoring potentials of each tile makes this an amazing game. The friends I tried this game with enjoyed it thoroughly. I personally think this is a game well worth having on your shelf.